Sadiq Khan was elected mayor of London on Friday. The son of a bus driver who grew up in a housing project is now running the world's financial capital. Sadiq Khan was elected mayor of London on Friday. The 45-year old son of Pakistani immigrants becomes the first Muslim mayor of a major Western capital city, following Boris Johnson into the post he occupied for the past eight years. The London mayor has fewer powers than his New York peer (London boroughs play a bigger role), but Khan will set overall strategy for a city that is critical to the U.K. economy and which plays a central role in global finance. It's also facing major challenges: a housing bubble, overcrowded and expensive transport networks and a growing gap between rich and poor. A vote by the U.K. to leave the European Union later this year could hurt its economy. Unrivaled as a business capital in Europe, London overtook New York last year as the world's top financial center in 2015, according to a study by Z/Yen. Yet 27% of its 8.6 million inhabitants still live in poverty, according to Trust for London, a charity that works to reduce inequality. And while employment has been growing steadily, the number of people from working families living in poverty has soared 70% in the last decade. Rising rents and the housing shortage dominated the election campaign. Kahn blamed the U.K. government for the crisis, saying it allowed foreign investors to buy up homes in London, using them as "gold bricks" to store value. The flood of cash from overseas helped drive up house prices, leaving homes unaffordable for many. The average house price hit £534,785 ($774,500) in March -- that's up 14% in a year and roughly 15 times the median London salary. Average London rents are now 62% of average incomes, according to Kahn. Khan is promising to stop real estate developers from selling homes off-plan (that is, before they're built) to overseas investors. He wants to force developers to give Londoners "first dibs" on new homes before offering them to foreign buyers. Trust for London says almost 700,000 jobs, or about 20% of the city's total, pay less than the minimum needed to cover the cost of living. The "London living wage" is estimated at £9.40 ($13.60) an hour. That compares with the national minimum wage of £7.20. 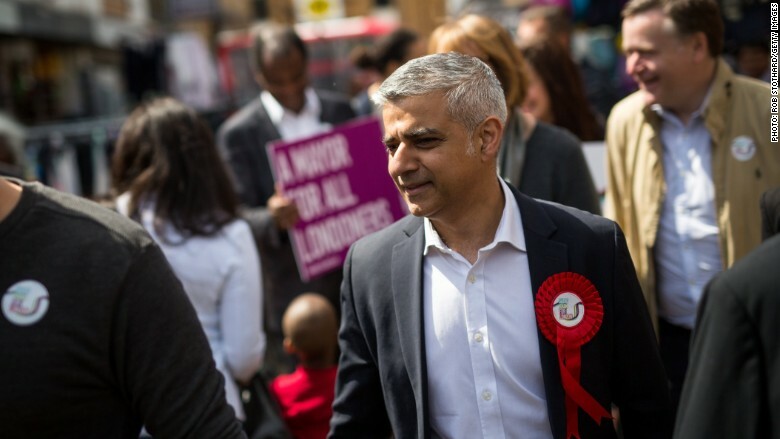 Khan wants to encourage more employers to pay the voluntary "living wage." He says he'll offer tax relief for small businesses who pay the higher minimum. He also thinks it should rise to about £10 ($14.50) an hour. Fares on London's tubes, trains and buses are among the highest in the world, and despite massive investment in recent years in new lines and stations, the network is becoming increasingly stretched by the growing population. Khan, who was a U.K. government transport official in 2009-2010, is promising to freeze London fares for four years, while continuing the program of investment to modernize the network. He says he can do that by cutting wasteful spending on bureaucracy and reducing fees for consultants.